The Clash's politicized lyrics, musical experimentation and rebellious attitude had a far-reaching influence on rock, alternative rock in particular. They became widely referred to as "The Only Band That Matters", originally a promotional slogan introduced by the group's record label, CBS. In January 2003, the band—including original drummer Terry Chimes—were inducted into the Rock and Roll Hall of Fame. 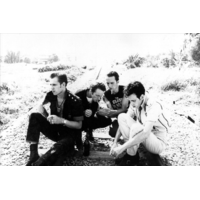 In 2004, Rolling Stone ranked The Clash number 30 on their list of the 100 Greatest Artists of All Time.